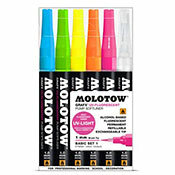 Molotow GRAFX UV-Fluorescent Basic 1 200.471MOLOTOWâ„¢ GRAFX UV-Fluorescent pump softliner (1 mm Brush-Tip) Molotow is proud to introduce the new UV-FLUORESCENT Pump Softliner marker. Featuring a proprietary, quick-drying alcohol-based ink. These markers give an almost permanent and exceptionally vibrant fluorescent color results. Applicable to almost all smooth surfaces indoors, these markers are a real must-have for the discriminating artist. MAIN FEATURES color intense alcohol-based special ink permanent quick-drying highly fluorescent under UV-light for interior use only refills available replaceable 1 mm Brush-Tip patented marker design ensures smooth application Marker is also available as single marker. 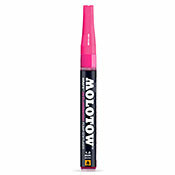 Molotow is proud to introduce the new UV-FLUORESCENT Pump Softliner marker. Featuring a proprietary, quick-drying alcohol-based ink. These markers give an almost permanent and exceptionally vibrant fluorescent color results. Applicable to almost all smooth surfaces indoors, these markers are a real must-have for the discriminating artist. Marker is also available as single marker.